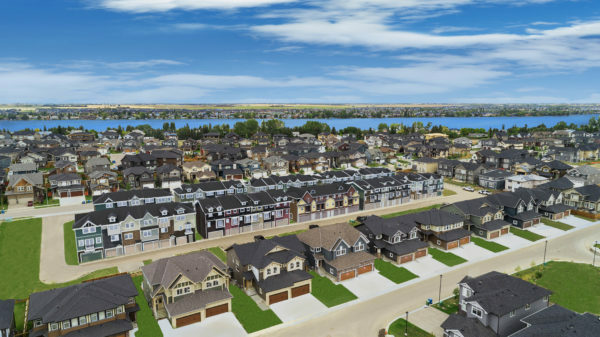 Chestermere, AB – The City of Chestermere is working hard to balance housing affordability and sustainability in the lake community with a developer-friendly attitude and policies that will, in the long-term, benefit everyone – including potential homebuyers. The community of just under 21,000, only a few kilometres from Calgary’s eastern edge, has long been known for its cottage lifestyle, albeit one that came with a fairly hefty price tag. “One of the things brought to our attention as a new council is the need to focus on getting more diversity of housing available, so people of all ages can live here,” said Chestemere Mayor Marshall Chalmers. The average absorbed price of a single-family dwelling in Chestermere in December 2018 was $672,800. The median household income in the 2016 civic census was $134,101. Compounding the affordability equation for many buyers is that single-family homes are the only option in Chestermere. According to Canada Mortgage and Housing Corporation statistics, nothing but single-family homes were built in 2018. There were 50 single-family homes at some stage of construction in February 2019, but no multi-family start since a single duplex was started in June 2017 and the last row home project was 27 units started in September, 2016. The Skylar Townhomes, recently launched in Kinniburgh, add 58 units to the market and are the first multi-family homes started in Chestermere in nearly three years. With a starting price tag of under $300,000, the town homes are below the local new home average. The project, by Alture Properties, is located at 248 Kinniburgh Boulevard, just three blocks off the lake. It will feature two and three-bedroom homes ranging in size from 1,240 to 1,700 square-feet and priced from $277,880 to just over $351,000. When complete, the site will include a courtyard and will be fully landscaped. For young couples and families who are looking for a lakeside lifestyle but don’t want to live in Calgary, Chestermere just became a legitimate alternative. It’s an amenity-rich, family-friendly community with quick access to Calgary. Plus, it’s the only community in this area where power watercraft are permitted. The City’s Strategic Plan includes projected growth to about 50,000 population over the next 25 years. The Skylar Townhomes show suite and sales centre is located at 248 Kinniburgh Blvd., on the east side of Lake Chestermere. Interested parties may register online for updates at www.skylarliving.ca or email: info@skylarliving.ca. About Skylar Townhomes – Skylar Townhomes aims to provide the best value possible in the best location possible. Interior finishings are highlighted by an open concept design with nine-foot ceilings, luxury vinyl plank flooring, quartz countertops and stainless steel Whirlpool appliances. A full-height four-by-16-inch glazed tile backsplash adds even more style to the gourmet kitchen. All Skylar Townhomes have their own outdoor space as well as access to the huge central courtyard.